Smart phones and other mobile technologies are changing the loyalty market. Fortunately, the change allows you to get more information about your customers. The days of paper punch cards and bar-coded swipe cards are dwindling, as the population becomes increasingly armed with the power of smart phones. Knowing how to adapt to these market changes is critical to continued business success. Many people feel leery about giving as much information as you’re asking for with a loyalty program. Encryption makes data input by the customer unreadable to the average person. You can then translate the data back into meaningful data by using an encryption key. You can provide this security measure to reassure customers that their data isn’t being misused and is being kept secure. Encryption takes a lot of technical know-how. If you don’t feel up to the task, make sure you hire someone you explicitly trust. Setting up an encryption code gives that person access to very privileged information. Punch cards are what loyalty programs used to be about. You probably have used punch cards before — those cards that you get punched (or stamped) a certain number of times and then you get a free product. Punch cards are a relatively easy way to do loyalty, but they have certain disadvantages. For instance, punch cards are anonymous. No personal information is attached to the card. You most likely do not know how many times a customer has redeemed a loyalty card. Anyone can pick up a card and use it. You know someone used a card, and that’s it. Punchd is an iPhone and Android app that lets you use the idea of a punch card. You add the Punchd capability to your register, and when a customer makes a purchase, she can scan her phone. Her punch is recorded, and when she collects the designated number of punches she’s rewarded. 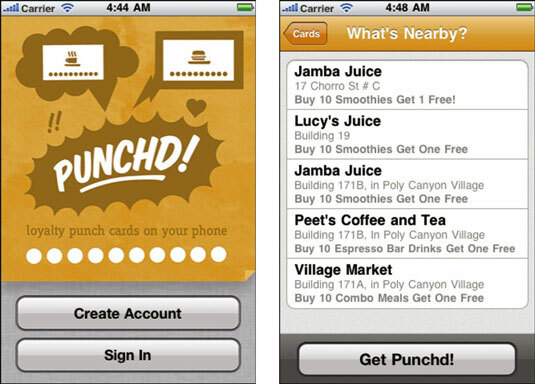 Punchd offers a simple way to make punch cards more useful. The processing power on an iPhone and Android phone is staggering. You can use the technology built into today’s smartphones to make using a loyalty program easy and more convenient — no having to carry around a card or ID number. Customers can scan their phones right at the register to cash in on their points. Soon, technology like near field communication (NFC) will make checking in via a loyalty program even easier by allowing a user to tap a phone at the register to check in or record a purchase. This convenience is a great way to reward your loyal customers. For example, Starbucks offers a couple apps. myStarbucks allows a customer to find a location, create and share a drink, and find the nearest store. Mobile Card allows a customer to enter a loyalty card number and scan the app at the register to pay for purchases. The app shows the card balance and recharges the card. Between January and March 2011, three million Starbucks customers paid with Mobile Card. The Cardstar app for iPhone and Android has digitized loyalty by allowing a customer to store the bar codes from your shopping loyalty programs on a phone. Recent integration with Groupon also allows Cardstar users to see surrounding Groupon Deals. Eliminating additional steps (like going into a separate app to see if there are specials) will make location-based marketing that much easier to add to a user’s daily dealings. 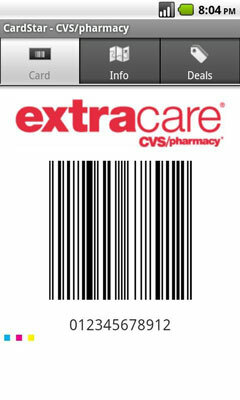 Cardstar allows someone to store bar codes and scan them at the register.